From the trailhead you can see where you'll be later in the day. Up there. Getting there: As you leave the Chisos Basin Lodge, take the only road that leaves the Basin. 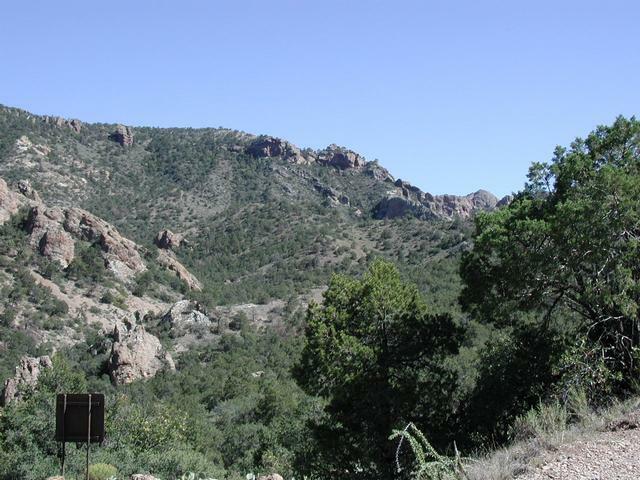 As you get near the rim of Panther Pass look on the right for signs indicating the trail and a small parking area to the side of the road. 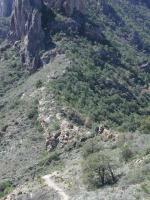 If you are coming in from below the Chisos Mountains look on your left signs and a parking area. A view along the trail. Casa Grande is to the right. 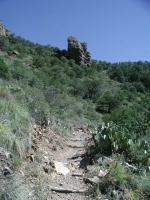 The Lost Mine Trail is by no means a trivial hike. 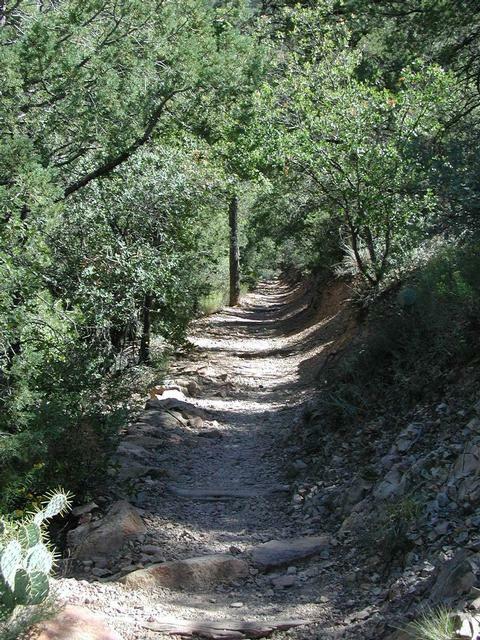 You'll cover almost 5 miles and climb over 1,000 feet. The hike starts off at the waypoint "Trailhead" and gains altitude immediately. However the first section of the trail features more gentle slopes than you'll experience later in the hike, in case you're weary of climbing or don't have much time to devote to the challenge. 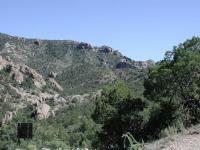 The earlier portions of the hike include dense coverage of Pinyon Pine and other trees. On your right you'll be afforded several magnificent views of Casa Grande Peak, one of the more famous Texas mountains. 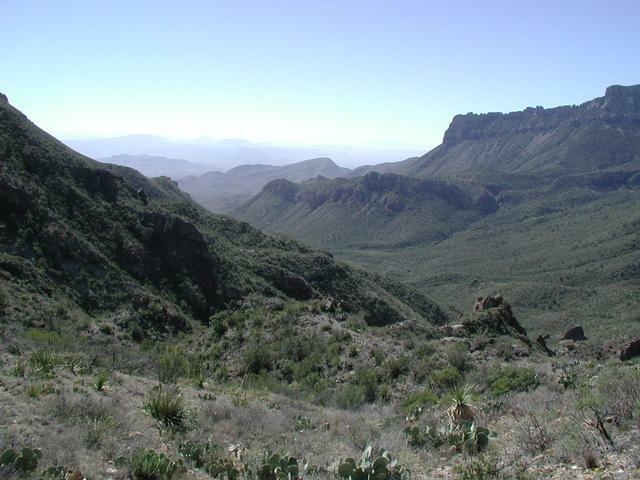 At this point you'll be almost directly on the opposite side of Casa Grande from the Chisos Mountain Lodge. The waypoint marked "Lookout" is a great place to take a rest before continuing the journey. Here you can find several rock outcroppings on which to sit and enjoy your first view of Juniper Canyon leading to the south. You should also be able to see some of the South Rim off in the distance. 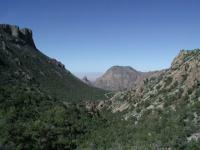 The delicate balance of Big Bend's ecosystems is apparent along this ridge. The northern side is more lush. If you look closely this spot also provides evidence of the fine line between desert shrub and forest in the Big Bend. Towards the west a ridge rises to Casa Grande. On the south side of the ridge relatively sparse shrub land is in contrast with the thicker forested slope of the north side. Since the north gets less direct sunlight, slightly cooler temperatures and better moisture retention Pinyon Pines and other plant species with similar requirements can thrive. The terrain after the Lookout begins to get steeper, particularly once the switchbacks show up, which should be fairly obvious on the map above. Here a reference point is the waypoint "Big Rock". This stocky rock spire juts out of the mountain and marks about the point which the switchbacks stop. The climbing won't be over at that point, but the steepness will lessen somewhat. 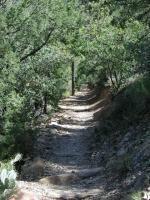 The switchbacks along the trail can be tiring. But concentrating on the rock outcropping ahead helps you keep focus. Along these switchbacks on the way down we encountered our first rattlesnake on our trip. He was sunning himself on a rock along the side of the trail. A couple in front of us was leery of passing along the trail with the snake there and tried to use a hiking stick to gently coax him away. The snake just calmly sat there and did not budge. Eventually they just hugged the opposite side of the trail and passed by, as we did. At no time did the snake rattle or make a move towards us. All he did was turn his head to keep his eye on us. Later, we asked a park ranger about the snakes and whether they caused problems for hikers. The answer was a pretty convincing no. According to the ranger there have been 4 snake bites in Big Bend in the last 20 years. It's a safe bet that some of those 4 attacks took place after someone foolishly tried to handle or harass the snake. So your chances of being in a car accident inside the park are probably greater than being bitten by a snake. When you see a rattlesnake don't get too close, don't touch it or try to scare it. Just leave it alone and it will almost certainly do the same for you. Looking down Juniper Canyon. The South Rim is in the distance slightly to the right. After the switchbacks stop the trail continues up a relatively gentle slope to what appears to be the peak. But it's not! The waypoint "Alt Peak" marks the spot you've been seeing for some time. Once you get there you'll notice that the trail continues along a ridge, now relatively treeless, towards the final peak. It's not farther and only slightly higher, so there's no reason not to continue at this point. Lost Mine trail gets it name from a legend that suggests that a secret mine existed in the area. Workers were blindfolded before being brought to the mine to work. Thus, they could not disclose the location of the mine. Legend says all of the workers were killed by local Comanche and the mine closed up to hide its location. Looking back towards the trailhead and the Chisos Basin further in the distance. While the name of this hike is the Lost Mine Trail you do not actually get to the top of Lost Mine Peak. 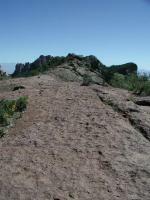 You can see the trail's namesake to your left as you progress towards the unnamed peak at the end of the trail. The waypoint "Peak" marks the location of a real peak. The trail ends as the rock juts abruptly upward to a point. You've reached the end. The peak provides an excellent place at which to rest, have lunch and enjoy the views. Juniper Canyon and the South Rim are still visible. Plus, the trip back to the trailhead is all downhill! 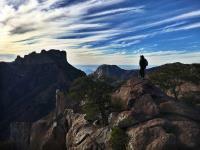 If you only have time for one hike in Big Bend, this is the one that we recommend. 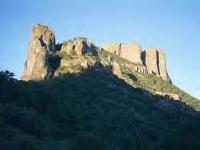 It is of medium distance and difficulty and provides a maximum of views and information about Big Bend. 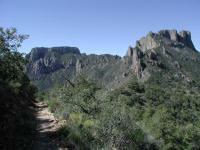 It is one of the more popular hikes in the park so you're not likely to go without seeing other people for hours like you might on other Big Bend hikes. We were the last hikers down in the evening of 10/26/2018. We are fairly active people in our 40s. For it to be rated as moderate isn't quite accurate. I've climbed peaks and trails (NM, AZ, MT, the Smokies, the Rockies, etc) that were simpler than and more moderate than this one. It was tough but enjoyable. It's definitely one of the most scenic hikes I've ever been. The park closed the trail that evening due to bear activity. We only saw bear scats. Two days later, I did see a bear about 20 feet from me when we stopped by on our way home so I can take a picture of the closure sign. I didn't know it was off to the side scrounging for food. It was scary although I didn't run, just walked slowly back to our car. It didn't even look at me. I look forward to going back, not for the bears but for the scenery. One of my favourite Big Bend walks... much shorter and easier than Emory Peak / South Rim, but offers great views over the Chisos mountains. I went late afternoon, and had the top to myself for almost an hour as the sun set. Go early - or late - and avoid the crowds! Pretty Trail, nice scenary. The last 1/4 mile is fairly steep and gives you a pretty good workout. 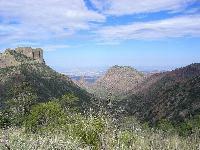 The end of the trail gives you some impressive views of the backside of Casa Grande and Juniper Canyon. If you are looking for solitude beware. Lots of people on the trail and the noise from the road is quite irritating especially the motorcycles. Other than Emory Peak this was our favorite. If it's too challenging for you you can hike the first 3rd (1.6 miles round trip) to the Juniper Canyon overlook. Saw a few tarantulas and one snake on this path. Every so often, I go for my Big Bend "fix". Stark, with a big helping of solitude, and in the pleasant (and mutually respectful) company of things that thrive there, relying on their thick skin, spines, thorns, fangs, and stealth. I had hiked in BB several times but never done the Lost Mine Trail due to the number of cars at the trail head, meaning more trail population than I was looking for. Well, this was the time for the Lost Mine Trail. It was fascinating; the cacti were mostly in bloom, the temp was a high of maybe 90°, the deer and the Mexican Jays were out, and the always unique scenery was there to entertain without end. I went clear to the point where I climbed this end-of-trail rock, scooted to the edge, looked over, caught my breath and muttered something, scooted back (a good ways) and had my sandwich, certainly in no hurry at all to leave. There was trail traffic, but not too much. Everyone was excited and fascinated, so the company was welcome. If you're wondering about difficulty, I am 73 and in half-decent shape; it was a pleasant jaunt for me. Be careful with the sun. You're a mile+ high and the sun beats down directly and also ricochets off of the rocks, so one gets plenty of exposure. I made it up and down, taking my time, with a liter of water, but was glad there was more waiting in the car. 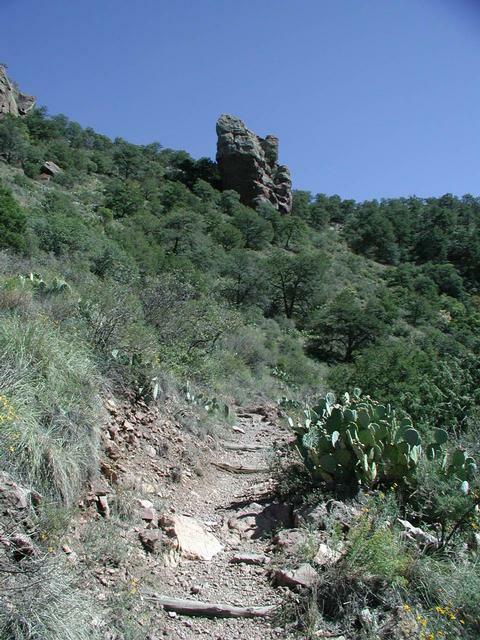 I will go again next year, and the next, and I will hike this trail again, with an eye on Casa Grande that always looms above, and wondering about how one gets up there. Maybe . . . .
By the way, one of the contributors here boasted that he/she had traveled 600 miles to enjoy the Big Bend. Who doesn't? (:-) Some good news though: this may be THE place in the Lower 48 where one is farthest from a Walmart or a Big Mac. Let's keep that our secret. Im not in the greatest shape but i was able to complete this hike in about 3 hours while stopping to take pictures quite often. Lots of nice views. Was quite windy today and the final stretch was a bit hard trying not to get blown away.